Happy Halloween all!! I am so excited its Halloween, but it's not just because of the candy. The next three months are full of festiveness, family, friends, and love. Oh and I also get older in January. Normally I wouldn't be too excited about that one but I think my 27th year of life is going to be pretty awesome starting with our Europe trip! Last night I finally carved our pumpkins! I look forward to carving pumpkins and roasting the seeds every year. Usually I try to do some difficult designs but this year I went a little easier on myself. 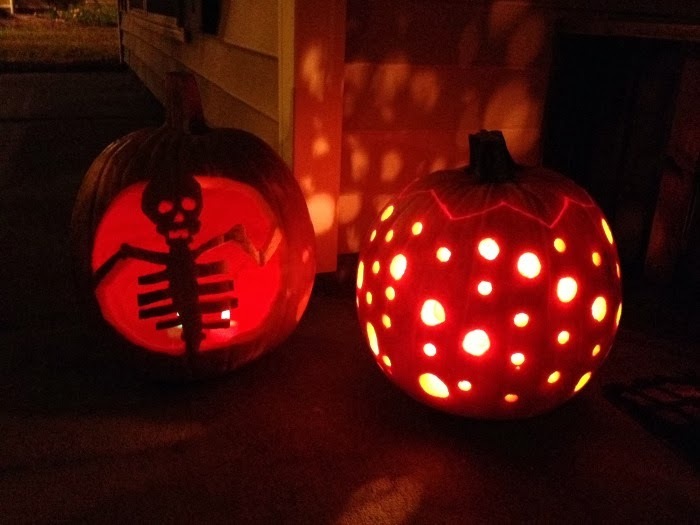 The hubs carved the pumpkin on the right using our drill.. he did so good! I love that it projects the light on the house like a disco ball! Last year I carved a Ruby look-a-like! This was probably my favorite out of all of the pumpkins I've carved. You can visit here for 26 free patterns of all different types of breeds! 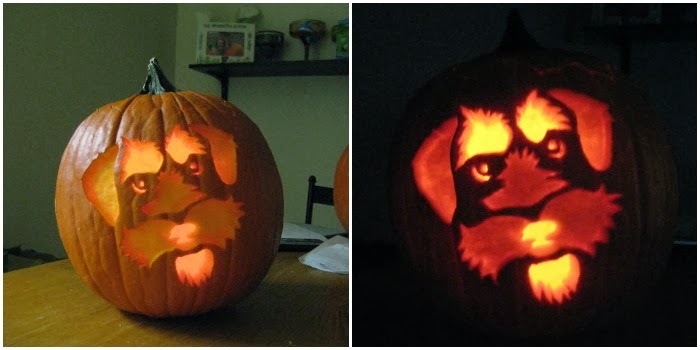 I know, we reached a new level of obsession with our pup when we carved this pumpkin! So far this week we watched Sleepy Hollow, the Goonies, Beetlejuice, and the Toy Story Halloween special... don't judge on that last one. Tonight we are following tradition by watching Hocus Pocus (again) while handing out candy to the kiddos. We've heard that we get a lot of trick-or-treaters in our new neighborhood so I'm starting to think we should have refrained from being fat asses and eating half of our candy stash. My Halloween costume might make an appearance on Instagram tonight... I know you've all been waiting on pins and needles to see it! ha! 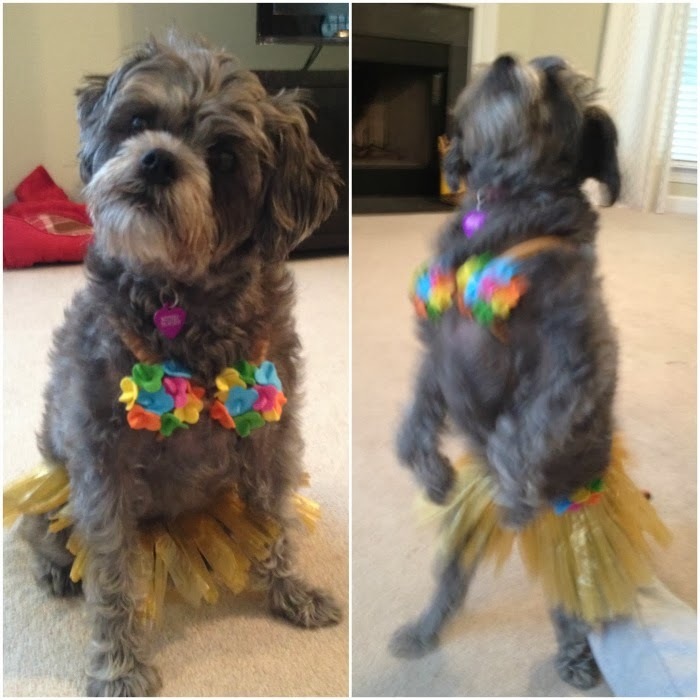 Until then, here is Ruby doing her hula thing! We actually entered this photo into a contest with our vet, she is only a few votes away from winning... I don't even know what the prize is but who doesn't love winning free things?! Speaking of winning, don't forget to enter for the Rifle Paper Co. giveaway! Anyone handing out candy to trick-or-treaters tonight or have fun plans? You better believe we'll be that couple giving out candy with a pumpkin beer in our hand! you must be so excited for your Europe trip! And I love that you carved your pumpkins on Halloween Eve...that would be such a fun tradition to start! Yes, so so excited!! I usually carve pumpkins earlier but I think that would be a fun tradition to do too, and that way your pumpkin isn't wilting by the time the trick-or-treaters come around! Omg...soooo cute! I hope you guys win! And yeah we already watched Sleepy Hollow, Goonies, Teen Witch, and Hocus Pocus...one will be on repeat tonight while we wait for trick or treaters. Happy Halloween friend! haha they are the best! How about when the Cat Pez "puked" out a pez? LOL! Ruby's costume is fabulous! Love love love! Thanks Taylor!! She wouldn't walk in it so she didn't have it on for long... haha! OMG I never thought to carve Finn into a pumpkin!! Next year's to do list! Your pumpkins look great! I love Halloween! Have fun passing out candy and seeing all of the trick-or-treaters! Thanks Jodi!! We like giving out candy too, the kids are so cute and excited when they knock on your door! Ruby is the best! I love her pumpkin! Love your Ruby pumpkin from last year! How did you do that? The Ruby pumpkin is precious! Love that we both dressed our kids as Hula Dogs! Great minds think alike! !